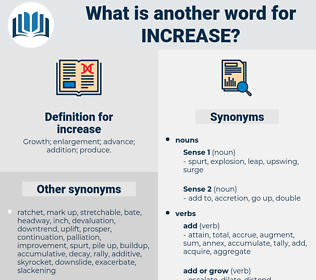 What is another word for increase? Growth; enlargement; advance; addition; produce. enhance, Enhancing, intensified, augmented, strengthen, strengthening, enhanced, ever-increasing. shifts, leaps, enhance, Enhancing, strengthen, strengthening, boosts, enhanced. reductions, expansions, increments, cases, percentages, advances, factors, spikes, elevations, results, additions, expenses, changes, Patients, charts, sinks, balances, revenues, highs, Grains, levels, reviews, Prices, returns, pressures, demands, peaks, shocks, Bonuses, Males, Studies, venues, leaps, boosts. men, progression, scaling-up, enhance, upswing, Enhancing, resurgence, recrudescence, elevation, acceleration, mark-up, worsening, tightening, deterioration, 'augmentation, upturn, ascent, strengthen, strengthening, amplification, exacerbate, progress, buildup, creation, prolongation, propagation, scaling, lengthening, accumulation, rate, consolidation, Propagating. consolidated, Surged, Incurred, lost, deepened, Climbed, Jumped, recorded, helping, required, Brought, Rendered, needed, led, focused, focusing, Accounted, held, made, enhance, Enhancing, intensified, strengthen, strengthening, enhanced. Adding, Enlarging, Sharpening, Bolstering, ameliorating, Stepping, Magnifying, Diversifying, Generating, allocating, Supplementing, Extending, Elevating, Influencing, burgeoning, upping, Enhancing, worsening, strengthening, scaling, lengthening. advised, upgraded, driven, projected, intensified, enhanced. aggravate, enhance, accentuate, expand, elevate, strengthen, exceed. reinforces, exacerbates, steps, represents, exceeds, sparks, occurs, lies, Comes, moves, reflects, Lives, Has, keeps, effects, Enhancing, strengthen, strengthening, boosts. amplify, sharpen, aggravate, enhance, worsen, Enhancing, inflate, magnify, maximise, accentuate, expand, elevate, ameliorate, lengthen, strengthen, exacerbate, prolong, progress, enhanced, creation, arouse, exceed, compound, incr., accrue. loss, Diminishment, abridgment, reduction, shrinkage, drop, compression, subtraction, decrease, decline, depletion. lowering, constriction, dissever, constricting, compressing, contracting, withdraw, shrinking, condensing, contraction, diminishing, deduct, shortening, condensation, minify, Retrenching, retrenchment, remove, abstract. play down, take back, undermine, reduce, restrict, lessen, demolish, condense, abridge, divide, decelerate, slow, deflate, discourage, halt, deplete, degrade, weaken, contract, cease, subtract, hinder, abbreviate, raze, prevent, compress, shrink, recede, hurt, fall, stop, shorten, diminish, repress, lose, retreat, curtail, narrow, destroy, lower. Their desire now was to increase the distance between themselves and the Murhapa village, from which all had had such a narrow escape.
" Yes," answered he, " if they desire to be greater than I am: but those who increase my power have a right to share it." leap, waxing, concentration, jump, runup, run-up, explosion, augmentation. maximise, step up, broaden, lengthen, kite, regenerate, boost, advance, manifold, build up, expand, raise, climb, irrupt, full, blow up, conglomerate, build, amplify, mount, multiply, add to, apprize, pyramid, rev, swell, stretch, shoot up, accumulate, gain, rise, inflate, up, pile up, spike, supercharge, deepen, pullulate, snowball, wax, widen, add, crescendo, appreciate, revalue, augment, ramp up, work up, amass, magnify, explode, enlarge, compound, maximize, extend, grow, rev up, apprise, heighten, intensify, gather, cumulate, escalate, accrue. change, alter, modify, change magnitude.